Use our postage rate calculator below above to determine what postage stamp you'll need when mailing your Christmas card, holiday photo cards, or even postcards. Simply enter the details about your letter or postcard and our calculator will automatically determine the postage rate you'll need to pay. This calculator is provided for use in conjunction with holiday cards, but it will provide a price quote on any letter or large envelope that you want to mail. Though every effort was made to make this calculator as accurate as possible, it is not an official tool from the USPS. We highly recommend taking a final, sealed version of your mailing to your local post office to be absolutely sure of the rate you'll pay. The rates above are only valid for domestic mail. 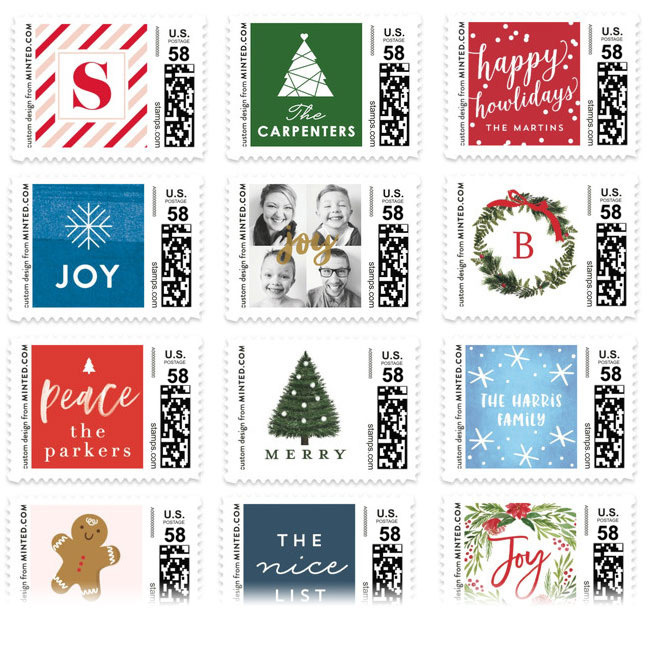 Minted has 3,000+ Holiday Postage Stamps – Find Yours! Still have a question about what stamp you need? Just ask.